Looking for an easy and fabulous appetizer for the holidays? Try this super yummy burrata on crostini, topped with crisp applewood bacon and caramelized shallots or onions. This is sure to be a go to recipe for any occasion. Heat the olive oil in a large skillet over medium high heat. Add the shallots and sauté for about 5 minutes stirring often. Add the balsamic and brown sugar and simmer the shallots until the bottom of the pan is dry about 6 minutes. Set aside. Heat the oven to 400. Slice the bread into ¼ inch slices and place on a baking sheet. Drizzle with olive oil and rub with the garlic clove. Toast for about 8 to 10 minutes until golden. Cook the bacon on a rack on a baking sheet in the oven until brown and slightly crisp, about 15 minutes. Drain on paper towels. Cut in half. 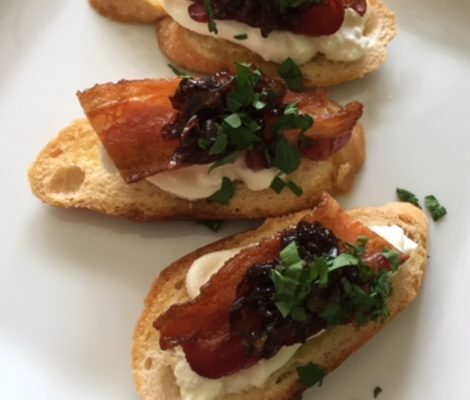 Place a slice of burrata on each crostini, then a piece of bacon and then a spoonful of the shallots. Drizzle with the extra virgin oil and then grind some pepper over each one before serving, garnish with parsley chiffonade.